Scalia reportedly on Texas hunting trip with members of exclusive Austrian hunting fraternity. 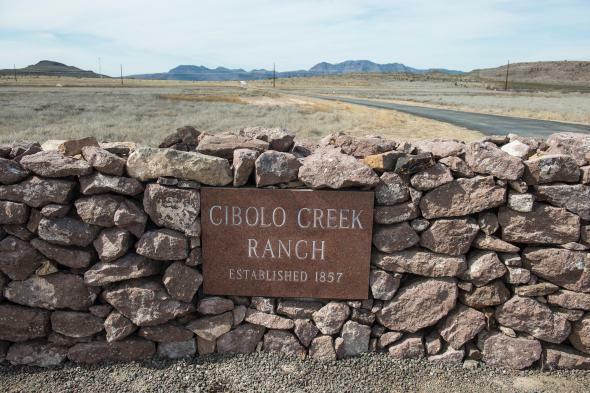 The entrance to the Cibolo Creek Ranch, the day after the death of Supreme Court Justice Antonin Scalia, Feb. 14, 2016 in Shafter, Texas. Let’s hope Donald Trump doesn’t read the Washington Post. The Republican frontrunner is not one to shy away from a juicy conspiracy theory and has the habit of verbally retweeting them. On Wednesday, the Post reported a story that is strange enough to fuel the fire of the crackpot right that smells a leftist conspiracy in the circumstances of the late Supreme Court justice Antonin Scalia’s death from natural causes. According to the Post, the lodge that hosted the hunting trip Scalia was on in West Texas earlier this month also hosted “high-ranking members of an exclusive fraternity for hunters called the International Order of St. Hubertus, an Austrian society that dates back to the 1600s.” The ranch’s owner, John Poindexter, and Scalia’s travel partner were both members of the organization and two other private planes that landed at the ranch for the weekend were also linked to the group, according to the Post. Members of the worldwide, male-only society wear dark green robes emblazoned with a large cross and the motto “Deum Diligite Animalia Diligentes,” which means “Honoring God by honoring His creatures,” according to the group’s website. Some hold titles, such as Grand Master, Prior and Knight Grand Officer. The Order’s name is in honor of Hubert, the patron saint of hunters and fishermen… Poindexter told CultureMap Houston that some of the guests dressed in “traditional European shooting attire for the boxed bird shoot competition” and for the shooting of pheasants and chukar, a type of partridge.